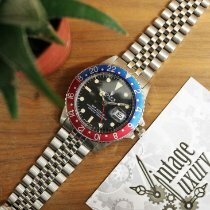 For sale is an excellent condition 40mm stainless steel Rolex GMT Master. 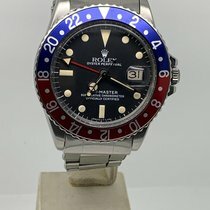 The 1675 sale is for watch only, does not come with any box or papers. 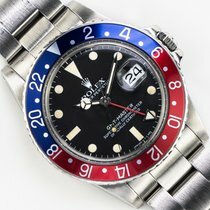 The GMT is fresh from spa service at the incomparable LAWW. The case has been redone, case back has been refinished as well, and it is on a generic strap and buckle. Please check the pictures, the watch turned out amazing, the case work is phenomenal! We believe the dial is original, bezel insert is period correct, and the hands original. One hand required some relume work, the gaskets were replaced, movement completely serviced, and a new acrylic crystal was installed. The one owner piece is a 2.10 million serial, which dates to 1968 on my charts. The tritium dial has some amazing color to the lume plots, something along the lines of a light pumpkin color. The matte dial itself has turned lightly, would not call it tropic in color, just a shade light of getting there. The railroad border is in fantastic shape, no missing marks; just a tiny bit of wear around the edge between 3 and 4 o’clock that I need a loupe to see. The bidirectional bezel is in really great shape, it has some wear, but is in great shape for its age considering it was a daily wearer. 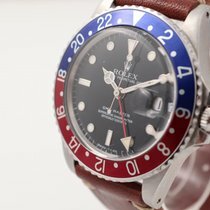 The GMT was pressure tested prior to returning from service, but it is not recommended to submerge.